These Chips were crunchy, but not necessarily as hard and firm as Kettle Chips usually are. There was a nice, crispy, snappy crunch, a little like regular Chips. These Chips did not seem quite as thick as many kettle Cooked chips. There were odd shaped Chips, as there is always are with this method of cooking, but in this pack they were relatively regular looking. Neither were they encrusted with seasoning and oil. A Nose Plunge Test revealed a somewhat peppery aroma. The taste was of a warm potato infused Jalapeno Pepper. It was a little spicy, but the heat came from somewhere else. 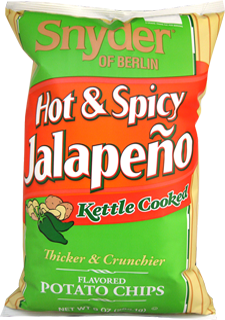 Almost as if the flavorful Jalapeno mixed with potato was added to by a hot salty taste. Whatever, the combo worked pretty well. Not the hottest or spiciest of Jalapeno flavors, but there is something for everyone. No-Heat-Allowed folk may enjoy them and as we all know, fans of very hot food will always say, "Nah, not hot."